A day of almost 60 degrees. We are all antsy for Spring. My wintersown seeds are hanging in there. The sunflower seeds already have sprouted. 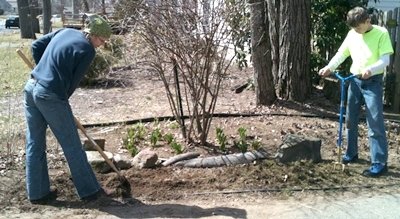 My daughter and grandson are outside starting to get the sunny earth ready for herbs. 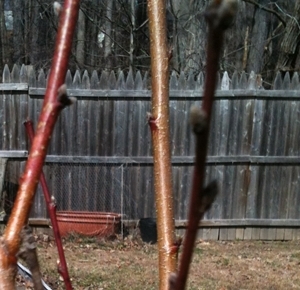 The peach tree has buds. 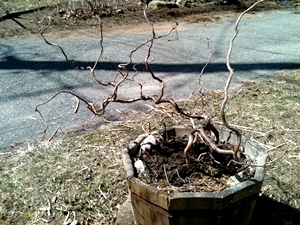 The branches of the pruned Harry Lauder Walking Stick tree make an interesting temporary front yard sculpture in the container that eventually will feature flowers. I got my windowsill garden started with some herb and berry seeds. Usually I think to start doing this in May, when it’s really too late. Hopefully I’ll have an abundance of heirloom edibles by the time Summer is in bloom. This entry was posted in creations, family, food, gardening by Elaine. Bookmark the permalink. Looks like you have some good helpers there. Happy planting!